There’s food, riding bikes around town, some shopping and outstanding coffee. Even the coffee must be skimmed over today as they pale into insignificance come 8:30pm, the moment this day becomes alive in a way to make the hours that came before it seem irrelevant, not worth commenting on. In a travel headspace where every day is an experience, each hour an opportunity and each minute a memory, wiping a day under the carpet requires a mighty shadow cast by an even mightier experience, opportunity and memory. At 8:30pm that juggernaut rises and the rest of this day now seems somewhat pale and insipid. We’re guided inside by our fiery haired kathoey host and seated down to our recycled timber benches and small table covered in plastic sheeting. Kathoey are often inaccurately labelled the generic term ladyboys, these emblematic characters of Thailand exemplify the openness and kindness of Thai culture so often mistaken for meekness. Far from being social novelties, sideshow attractions or worse, Thailand as a nation has grown up and no longer exists in the immature playground of self esteem defined social ladder climbing. In Thailand, more than anywhere else I know, humans aren’t defined by their dress, how they refer to themselves, how they do their hair or what clothes they wear; rather on richer principles of human character. Sounds like a lesson our mums gave us when we were about six. There’s a corrugated iron roof above our heads and a rough concrete floor below our feet while pockets of small stalls line the edges of this hall hinting of a time when this place was a market or rustic food court. How long ago that seems now. The lights are there still, beaten tin cones top incandescent bulbs casting the small hall into a warm glow through spiderwebs and years of dust that no one has gotten around to cleaning and probably won’t get around to cleaning anytime soon. Over a warm smile just for us and eyes scanning the needs of other customers our host places our beers before us before disappearing into the hum of a steadily swelling crowd to attend to the needs of too many. A small whining musical instrument like a bagpipe that farts a low off key note every now and then rises above the pitch of the crowd now swollen to grant a throbbing buzz to this hall of tenuously contained excitement. The music stops, the crowd cheers and the only truly lit space in the hall receives two young guys. The host gazes hawk-like over the crowd but all eyes are on the two guys on the stage who are in truth just boys of barely teenage years at best. 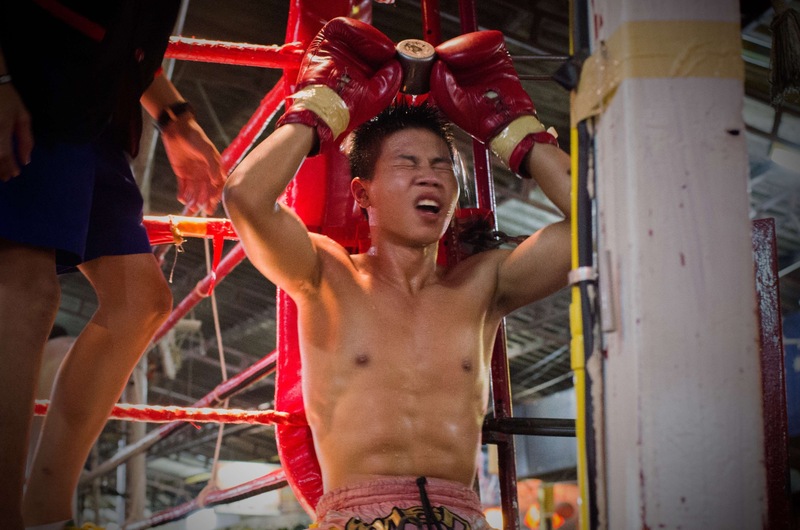 The boy closest to us lowers himself to the canvas clad stage to commence his Wai khru ram muay. 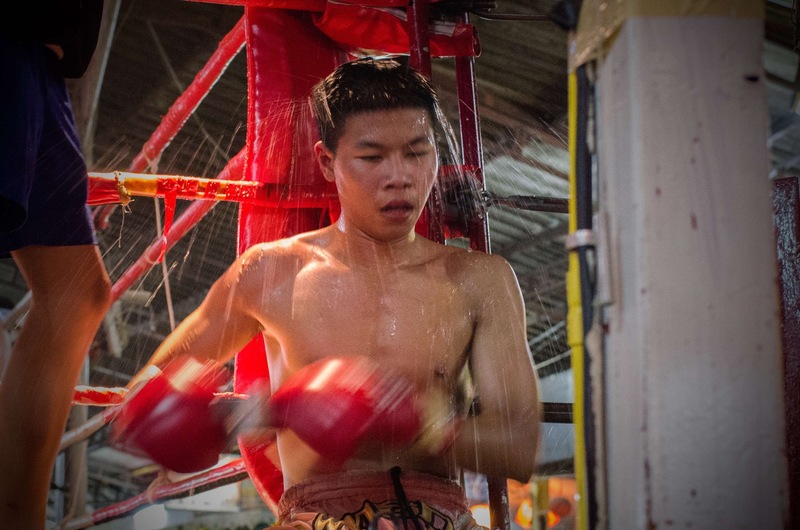 Wai refers to hands being held together in prayer; khru, teacher; ram, dance and muay of course is boxing, Thailand’s national sport, pastime and obsession. A ram muay is a personal and unique dance before each fight displaying respect to their masters, homage to their king, appreciation to their crowd and prayers for strength and success from mystic idols. The boys, now gods themselves, own this room and like seasoned stars the ring is their stage as the ram muay gifts solemnity, sincerity and integrity to the brutality they are about to commit. A prayer is said into each corner to seal the ring of ill omens and luck, their world reduced to the stage. There’s no posturing, trash talking or false bravado; these boys exude a respect and dignity I’ve rarely ever seen anyone of this age govern; anybody of any age for that matter. 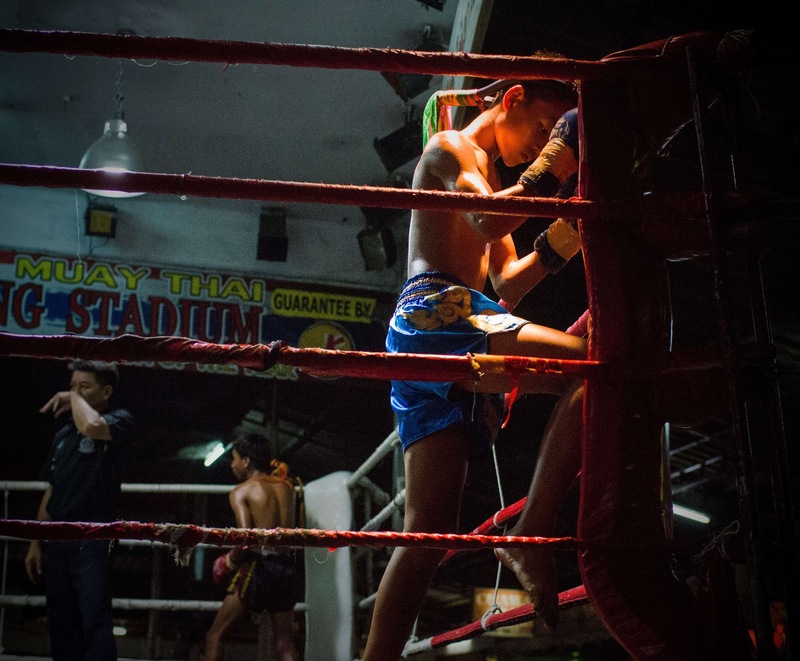 We took our seats on the buzz of a tourist must-do and in a few motions a pile of new layers squash the flighty ideals we had of seeing a spectacle, Muay Thai rises far above gambling, prizes, notoriety and money. The boys are less than 50kg in weight, tiny boys, yet as the whining pipe rises it’s tune to join a beating drum this dim room becomes a hypnotic dance capturing the movements of the boys and our breath alike. The boys are tiny in stature but after calling into themselves power from their ram muay and drawing the focus of the world to the music and their foe these tiny boys stand as giants above all in the room, the world. 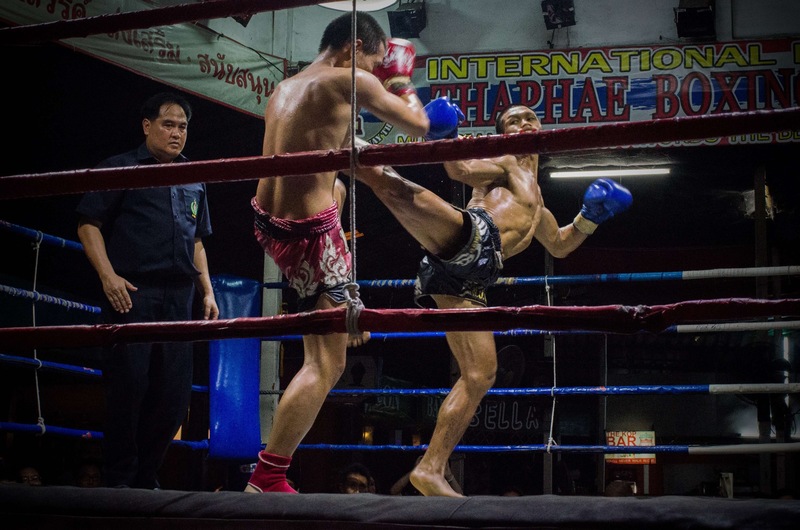 Muay Thai originated as a lethal military art, even now in this ring the neck and spine are targetable areas, the stage sealed to keep ill omens out is also sealed to hold the unabashed brutality within. Flashing kicks, fierce elbows and violent knees whirl around in a dance rather than a brawl, artistic brutality has never been more clearly defined and we stare in awe. We both play rugby, a sport where aggression, physical battle and summoning courage to overcome fear all mix with genteel boundaries of respect and honour; in this respect we should understand a sliver of this elegantly brutal dance before us. That we should understand doesn’t mean we do. Attempting to destroy another persons body goes hand in hand with genuine congratulations to an opponent for a landed kick, prayers to the opposite corner and steely eyes in the face of terror like I have never seen. You’d think we might be able to get a slight catch on the headspace required to balance this honour and poise in the face of violent action but it’s with no shame that we hold no hopes of grasping the slightest shadow if this art. In this respect these tiny young boys hold a courage and focus I’m quite certain I’ll never attain in my life. 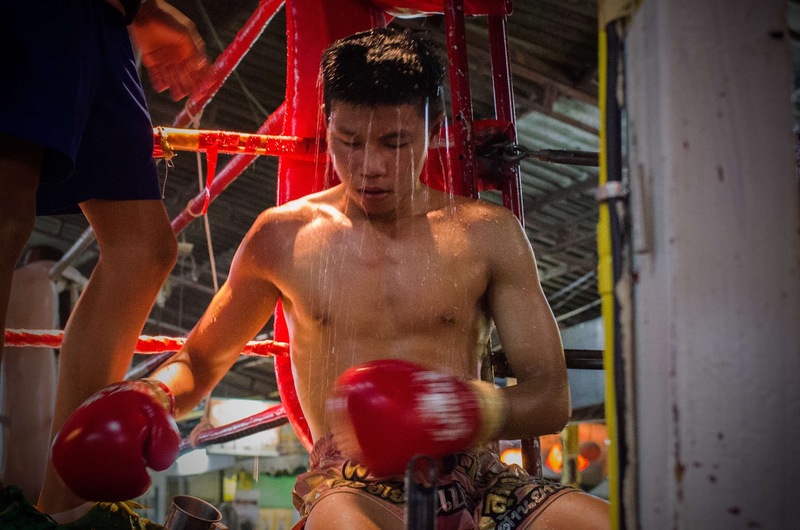 In the true equality that encompasses so much of Thai culture there’s lady fights as well that lack none of the intensity and passion of the boys and men. 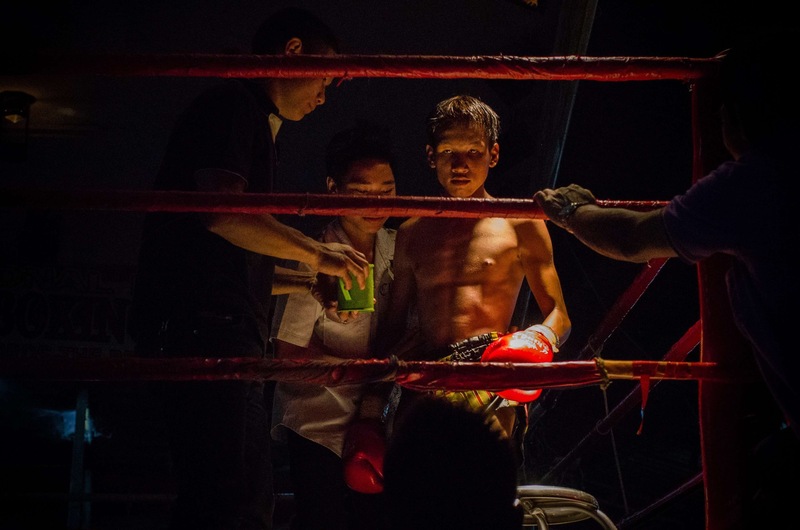 Muay Thai paints for us a picture of Thai culture that has scratched the blurry edges of our perception and makes it clear and focused within this sealed ring. We’ve heard the arguable line that Thailand remains the only nation on earth never to be conquered and right now it seems that whether it’s accurate or not, what we’re witnessing is the reason why. In the intent gaze of a young girl who allows a foot to strike centimetres from her face without shifting a millimetre or blinking once, focused only on a chance to attack, Thai culture is embodied: respectful, fierce, integral. Shirt on now the small boy from our corner is back at ringside watching his fellow pupils compete. Where there was a weapon channeling the power of gods there is now a tiny boy with a big smile so disarming and playful; in appearance. We might have bought a coffee or rented a bike from him and given him no more than a clumsy ‘thank you’ in Thai that we still can’t pronounce properly never knowing what lay behind that smile. Of six fights we see 12 fighters in whom there is no space for ego, thuggery or ill intent, just that respectful ferocity we can only dream of. We came for an eyes wide open experience but we leave past the thankful nod of our host into the night with the gift of Thai culture and its people pumping through our veins, still breathing the rhythm of the pipe who’s rolling wail has since ebbed to silence. Thailand is a popular holiday destination for so many, it’s famed affordability, party nightlife, glittering beaches and crystal clear water are often the attraction. And in hoards they come to consume the lifestyle, consume the alcohol, consume the good times among this culture that sits politely by welcoming everyone and paying the crassness little heed. Those socially anaemic travellers have always been a bit of an abhorrent blight but walking out into the warm night air the tragedy of seeing Thai culture as a cheap beer and a rope swing into a beach takes on epic proportions. If only those consuming tourists could hand back the coffee to this sweet young Thai boy they give no thought to, then piss him off in a dark alley; oh how much I’d pay to see that.